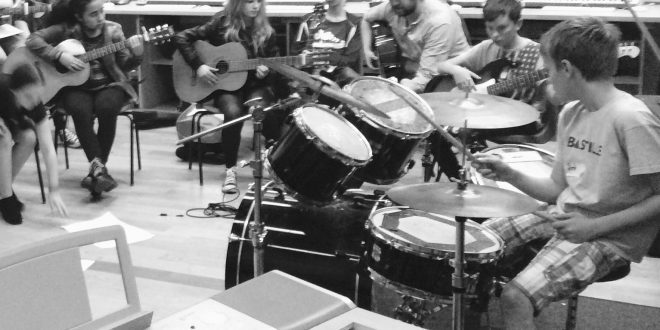 Music Rock and Pop Club is now in its second year of coaching young musicians to develop their band skills. It is led by Ross Wilson, who is a leading specialist in Rock and Pop and Music Technology. Due to the success of students at Cottenham, Music Factory clubs are now spreading to other schools in Cambridgeshire. It was with great delight that majority of these bands were praised highly by our judges in ‘Battle of the Bands’ for their stage presence, originality and togetherness as a band. This club takes place in the Music department on Wednesday 15.15-16-45. Application forms can be accessed from the link below or from the music department and can be handed in on the first session of each term. Please note that guitarists are advised to bring their own guitar and lead which can be stored in the music cupboard. If a student is not currently in possession of their own guitar, a limited stock can be booked in advance through Miss Manser (Head of Music). To download the Music Rock and Pop Club Application form please follow this link. It is expected that all instrumentalists take part in one extra-curricular ensemble activity as this is such an important part of their musical and social development as young musicians. Ensemble performance is now a prominent aspect of GCSE Music and such skills take time to develop. To support our curriculum and requirements for GCSE, each group will be encouraged to draw on ideas, sounds and features of baroque, classical, romantic, blues, jazz, musicals, chamber music, pop and rock (inc bhangra), fusion and film music. Orchestra – meets on Monday afterschool with Vanessa Brown in Mu1.